Synthetic peptide conjugated to KLH, corresponding to amino acids 576-592 of Human RYK. This antibody is purified through a protein G column and eluted out with both high and low pH buffers and neutralized immediately after elution then followed by dialysis against PBS. Our Abpromise guarantee covers the use of ab5518 in the following tested applications. WB 1/100 - 1/500. Detects a band of approximately 67.5 kDa (predicted molecular weight: 72 kDa). May be a coreceptor along with FZD8 of Wnt proteins, such as WNT1, WNT3, WNT3A and WNT5A. Involved in neuron differentiation, axon guidance, corpus callosum establishment and neurite outgrowth. In response to WNT3 stimulation, receptor C-terminal cleavage occurs in its transmembrane region and allows the C-terminal intracellular product to translocate from the cytoplasm to the nucleus where it plays a crucial role in neuronal development. Observed in all the tissues examined. Belongs to the protein kinase superfamily. Tyr protein kinase family. The extracellular WIF domain is responsible for Wnt binding. Proteolytically cleaved, in part by presenilin, in response to WNT3 stimulation. Cleavage occurs during neuronal differentiation. Membrane. Nucleus. Cytoplasm. In cells that have undergone neuronal differentiation, the C-terminal cleaved part is translocated from the cytoplasm to the nucleus. ab5518 at a 1/100 dilution staining approximately 67.5kDa band of RYK in Jurkat cell lysate by Western blot (ECL). ab5518 at a 1/100 dilution staining approximately 67.5kDa band of RYK in Jurkat cell lysate by Western blot (ECL). 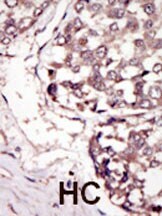 ab5518 staining RYK in human hepatocarcinoma (HC) tissue by Immunohistochemistry (Formalin/PFA-fixed paraffin-embedded sections). Publishing research using ab5518? Please let us know so that we can cite the reference in this datasheet. There are currently no Customer reviews or Questions for ab5518.